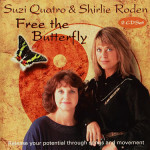 Genre : A unique double CD, specially created, written and performed by Suzi and Shirlie, to help you connect with your inner self and discover the Lessons of your Life. Based on the idea of the School of Life, this CD works with the elements of Water, Air, Fire, Earth, Wood, Stone and Gold in the form of seven separate songs. Together with a guided narration by Suzi or Shirlie, each element allows the listener to discover and unearth their feelings and emotional truth. Suzi and Shirlie lead you with words, music, sound and movement to let you lose your inhibitions, express your truth and emotions, and become your own alchemist to transform your shadow into pure gold. "Thank you again for sharing your joy, beautiful voice, wonderful music and love with us. May you continue for a very long time bring such Good News to the people." Signup to my newsletter for the latest on me, my workshops, music and concerts.